Walking into the headquarters of Maingear, a boutique gaming PC builder based in New Jersey, the building looks like a few that surround it (albeit a bit cleaner): a custom auto body shop. The front desk and lobby are adorned with countless awards and magazine clippings – with TechRadar’s friends Maximum PC featured among them – resting on shelves and hanging on stark red and white walls. While showing off a set of sick-looking chassis painted custom by DC Comics artist Tommy Castillo, co-founder and CEO Wallace Santos recalls Maingear’s humble beginnings. A stark logo meets visitors in the Maingear lobby, one found predictably plastered throughout. The wall of magazine clippings includes fellow Future outlets, like Maximum PC. These two chassis were painted by DC Comics artist Tommy Castillo. Castillo provided the artwork for Batman Detective and Legends of the Dark Knight. Newly certified as a networking systems professional, Santos became an independent consultant in 2002. Not long after, a custom gaming PC order gone wrong inspired Santos to try his hand at building computers, already a passion, professionally. A lucky break at a CES in Las Vegas and a plug from famed tech pundit Leo LaPorte launched the Maingear rocket, but not without some refinements to its process over the past 15-plus years. So, to accommodate Santos’s love for both PC gaming and automobiles, the CEO created a working environment that looks a lot like the custom car shops seen on shows like Pimp My Ride, only with 100% less Xzibit. Because every technology hardware company practically requires such an area. Your first sight stepping into Maingear's assembly area. There are three such building stations. Each of these gray bins contains the components of exactly one custom-ordered gaming PC. The end results tend to look like this. Beyond embodying Santos’s love for custom cars, the attention to detail and tailored service that scene is known for is what the founder and his team care about capturing. What that looks like is a large garage stands behind Maingear’s office building.The shop buzzes with the sounds of whirring hand drills and snapping cable cutters. The first sight upon walking inside are PC builders putting elaborate desktop rigs together, but not at record speed. They’re moving quite quickly, but with precision. They know these chassis in and out, taking one gray bin of PC parts off the shelves at a time and fitting them perfectly inside a variety of chassis, some original designs. Those perfect-looking fits grow challenging when the customer orders hardline liquid cooling, much less choosing which pipe fittings to use. Maingear's custom-fitting these Quadro GPUs to a new motherboard for a silent rendering rig. Here's more of that custom GPU work being done in-house. And, here's where those custom-fitted Quadro GPUs will eventually appear. This is one of two enormous imaging rigs. One of several options for how your Maingear PC will be shipped. When the PCs are finally built – which sometimes involves customizing components to work in specific scenarios, like the above Nvidia Quadro GPUs going into what will be a silent graphics rendering machine – they’re taken to these Matrix-looking monitor rigs for imaging. 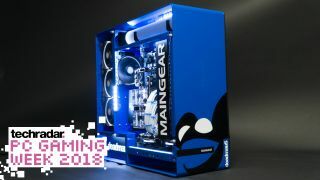 It’s here that Maingear custom images each ordered machine, whether it be a laptop or desktop, according to his or her requests and only those requests. This means only the drivers that the customer needs or wants. And, yes, this includes the HP Omen and Razer R1 machines that Maingear builds and sells in tandem with those brands. The images are delivered by an OPK server that can fully install a built PC’s BIOS and operating system – drivers and all – in just seven minutes. Now, that’s fast. When you’re building PCs with this kind of care, time can’t be wasted on imaging systems. When a PC is ready to ship, Maingear offers several different boxing options, from straight-up (albeit reinforced) cardboard to plastic crates and luggage-style, plastic shipping crates. But, no Maingear shipping container is closed without getting a spritzing of some new car smell. It’s at this point that we’re taken out of the building and across the driveway to another garage, but this one is outfitted to be an automobile-grade painting operation. This is where Maingear paints its various custom PC chassis. This is what one looks like primed. Doesn't that painting gear look familiar? It's all the same tools and techniques used when painting automobiles. Looking just like the spray booths at auto body shops, Maingear has hired ex-auto painters to apply their skills to its line of PC chassis. Save for what’s actually being painted, nothing about the process is different from that of painting an automobile, we’re told. The result being, of course, is a PC worthy of a photo studio, where all of Maingear’s opulent videos are shot. Take this gorgeous gaming rig custom built for famed DJ and producer deadmau5, for instance. So, when you order a gaming PC from Maingear, this is where and how your PC is built, egregious chrome pipe fittings and all.